Pathogens « Global Market Insights, Inc.
Increasing threats over food consumption have stimulated global food safety testing market and generated demand for effective test products that can ensure food safety. Food supply worldwide is facing a range of risks from environmental toxins, bacteria, and food allergens. Food safety testing industry size has been growing substantially, owing to the increasing threat of foodborne illness, and stringent food safety regulations. Moreover, expansion of import and export business of food supply across the globe is expected to further boost the demand for food safety testing market. According to Global Market Insights, Inc., “Food Safety Testing Market size worth USD 9 billion in 2015, is estimated to grow at a CAGR of 7% over the period of 2016-2024.” The food safety testing industry growth will also be influenced by the expansion of global processed food industry which is anticipated to surpass USD 7 trillion by 2024. The most common source for contamination of food is pathogens. These pathogens can cause various gastrointestinal disorders such as abdominal cramps, vomiting, diarrhea and nausea leading to increase in illness and death of around 2 million people every year. Growing food epidemic has mandated the laboratory testing for Salmonella, Listeria, E. Coli, Campylobacter types of pathogens, in turn making food pathogen testing market to be a major revenue pocket accounting for 30% of the global demand. Pesticide is another type of contaminant causing health disorders. The pesticide food safety testing market worth USD 800 million in 2015, will witness substantial growth, owing to regulatory norms in using of certified and organic pesticides. Contaminated food is a very serious issue which may result into demise. As per WHO’s statistical report in 2014, over 2.5 million people died due to diarrheal diseases. Moreover, U.S is facing an alarming rate of increase in foodborne illness resulting into nearly 5 thousand deaths and more than 325 thousand hospitalizations every year. This has generated the need to implement quality and safety checks, where consumers have the authority to trace their ready to eat meals, processed products, bakery, preserved & canned products. In this regard the EU and FDA have given conformities with consumers’ rights to track food through all production and distribution stages, in turn driving the food safety testing industry. In addition, major food regulatory bodies and authorities such as Good Hygiene Practices (GHP), Good Manufacturing Practices (GMP), Hazard Analysis Critical Control Point (HACCP), and Good Agricultural Practices (GAP) are extending extensive support in ensuring food authenticity, thereby, propelling the food safety testing market growth. 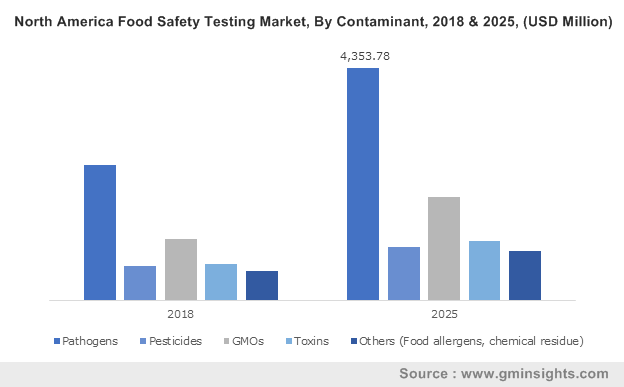 The food safety testing technology market has witnessed a noticeable shift towards rapid food safety testing technology market from the time consuming traditional food safety testing industry. Increase adoption in biosensors, ELISA, rapid culture detection, and PCR-based techniques are widely adopted technologies used to examine the count, metabolites, and type of micro-organisms. The growth in food safety testing market is also poised to benefit from increasing consumption of meat, poultry, and dairy products. Unhygienic condition while skinning and handling animals in slaughter house is the key responsible factor favoring the meat and poultry food safety testing market. Similarly, dairy products can also get easily contaminated through infected animals. Regulatory bodies such as the FSIS and HACCP are taking major steps in preventing meat & poultry product contamination and implementing adequate pasteurization of dairy products stimulating the food safety testing industry share. Europe food safety testing market valued over USD 2.5 billion in 2015, with U.K and Germany leading the regional demand. Increasing consumer awareness and stringent food safety regulations will boost the demand for Europe food safety testing market over the coming years. Asia Pacific food safety testing industry will emerge rapidly due to rising population, growing demand for food products, and increasing stringent regulations for food safety. China being the major export trade market is anticipated to witness annual growth rate of 11% over the period of 2016-2024. The food safety testing market is consolidated with top three players sharing 45% of the overall business space. The key industry participants include Intertek, Bureau Veritas, SGS, Det Norske Veritas, Eurofins Laboratories, Idexx Laboratories, ALS Laboratory and Bio-Rad Laboratories. This entry was posted in FOOD, NUTRITION AND ANIMAL FEED and tagged Campylobacter, Dairy, E. Coli, Food Pathogen Testing Market Size, Food Safety Testing Market, Food Safety Testing Market in India, Food Safety Testing Market report, Food Safety Testing Market Size, Food Testing Market India, Fruits, Global Food Safety Market, Global Food Safety Testing Market Size, GMO, Listeria, Meat, Pathogens, Pesticides, Poultry, Processed, Salmonella, Toxins, U.S. Food Safety Testing Market, Vegetables.